Page from Artforum 7, no. 1 (September 1968). Jack Burnham, “Systems Esthetics.” Pictured: Dan Flavin, Pink and Gold, 1967. A BRIEF METEOR, Jack Burnham blazed forth in September 1968 declaring “Systems Esthetics” to be the preeminent mode of contemporary artmaking. How could this sculpture teacher from the Midwest have gotten it so right? In the ensuing decades, what Burnham called “systems” came to define some of the most significant cultural developments of our time, even if this genealogy has been obscured. Undeclared as such, systems thinking now suffuses the art world as we know it. Consider: The work of such different artists as Olafur Eliasson, Andrea Fraser, Damien Hirst, Seth Price, and Tino Sehgal, as well as platforms such as Triple Canopy, would be hard to understand without recourse to some concept of art as a disparate, sprawling, yet rule-bound system within which artists must strategically acknowledge dealers, viewers, performers, participants, buyers, fabricators, curators, programmers, institutions, infrastructures, the environment, magazines such as Artforum, algorithms, and other constellations around and within the ever more expansive work of art. Burnham called it. And Artforum, under editor John Coplans, continued to push it, with Lawrence Alloway’s “Network: The Art World Described as a System” appearing in 1972. But Burnham’s thesis has become unaccountably obscure. One factor was the revulsion that soon confronted the very term systems and the source of its discourseBurnham’s first footnote refers to the Rand Corporation’s 1964 publication Analysis for Military Decisions, and the obvious entanglement of systems theory with the military-industrial complex was a fatal attribute in the eyes of his largely leftist audience during the Vietnam era. By 1980, Burnham himself was unwilling to continue plumping for this unlikely constellation of war games and process art, castigating his early techno-utopianism as a “panacea that failed.”¹ But the ultimate answer may be that systems didn’t fail: They simply wormed their way into the art world like a weakened virus. Contemporaneity is built on Burnham-like “systems”; their code laces our cultural genome. Exploring the evolution from Burnham’s vision of a “systems esthetics” at the core of art-world discourse to our current reality of systemic practices not only opens up alternative historical perspectives on the intervening decades but suggests a fresh view of much contemporary art. The systems virus is still herebut it has mutated from Burnham’s engineering and industrial setups into the social and electronic protocols that govern our world. Burnham bemoaned that the systems esthetic “has no critical vocabulary so necessary for its defense”; what we got instead was a critical vocabulary utterly defended from its own sources in systems thinking. Reading the original 1968 essay today is an exercise in reverse teleology. It reveals Burnham as an ambitious player in the high-stakes gamble over the legacy of modernism initiated in the 1950s by Clement Greenberg and carried on by Michael Fried. Indeed, Burnham explicitly engaged the latter’s essay “Art and Objecthood”published in Artforum just a year prior, in 1967. Burnham was keen to move beyond both Donald Judd’s “specific objects” and the battle with Fried about “objecthood,” seeing them as contesting bounded entities rather than engaging the newer logics he observed in Dan Flavin’s “articulated illumination systems” (so distinct from “light sculpture”), Hans Haacke’s “open systems” (so different from “kinetic art”), and Les Levine’s systems-based interactive “environments” (so separate from “Happenings”). Beyond the inversion of Fried that Pamela Lee addresses, Burnham’s systems outlined a countertrajectory that laid claim to the entire future of contemporary art.² Systems artists were not only “post-formalist” (which Burnham argued explicitly) but “post-Minimalist” (as Artforum editor Robert Pincus-Witten would soon declare). In “Systems Esthetics,” Burnham held Levine in particular as epitomizing a systems approach that abandoned the object without forsaking an engagement with physical reality. Transvaluing Fried’s horror at Tony Smith’s sublime drive thorugh New Jersey, Burnham praises Levine’s Clean Machine: “By means of an experience’s ambulation through them, [Levine’s environments] consistently alter their own degree of space-surface penetrability. . . . One is processed as in driving through the Holland Tunnel.” This is phenomenology rather than sociability; being “processed” by an experience makes Levine’s viewers subject to their environments, but not agents of them.³ While this kind of work would later be grouped with Conceptual art, already heralded by Lucy Lippard and John Chandler as a “dematerialization,” in it Burnham recognized physical “systems” that enmeshed the viewer in a range of embodied, conceptual, and planetary entanglements that art would both instantiate and reveal. It seems clear that part of Burnham’s agenda was to arrogate for artists goals that could rival the systems being developed elsewhere (from Landsat to IBM). In 1968, such systematic ambitions were epitomized by the work of Flavin, Levine, and, even more consistently, Haacke, on whom Burnham had just published a first monograph.⁷ Burnham’s support for Haacke, and Haacke’s admiration for Burnham, vectored them both to MITarguably the narthex of all things system in 1967–68. 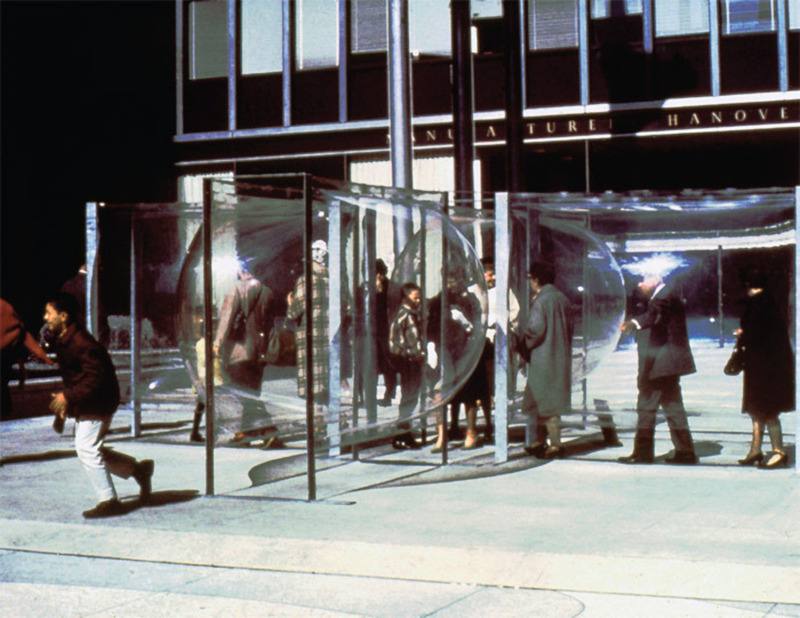 Les Levine, All Star Cast, 1967, Plexiglas, aluminum. Installation view, Time-Life Building, New York. Photo: Les Levine. The radical consequences of this imperative were revealed by the legendary cancellation of Hans Haacke’s planned retrospective at the Solomon R. Guggenheim Museum in the spring of 1971. Exemplifying the “liquidation” of the artist in a way Burnham had never anticipated, the Guggenheim cancellation demonstrated that systems art had merged with society’s systems and was thereby subject to their political, legal, and economic forces. The cancellation was thus both the apotheosis of systems and the moment after which it would become difficult to say its name. In this light, it is moving to read Burnham’s response to the exhibition that never happened, writing in June 1971 of Haacke’s plan to work with “physical, biological, and social systems,” the totality revealing the artist’s commitment to “the interconnectedness of all systems” and an art that could interrogate “the way the world functions on its most essential levels.” Given the cancellation, Burnham was forced to conclude that the Guggenheim had decisively altered Haacke’s “systems art,” which could therefore be understood as drawing closer “in its semiotic structure . . . to the ritual drama (where the artist’s premises are recapitulated in everyday life) and away from the plastic arts.”¹² (The emphases in both instances are Burnham’s.) Never more prescient than here in his anticipation of the shift from techno-mechanical systems to social protocols, Burnham nonetheless lost the capacity to shape artistic discourse, or to advocate for “systems” as a concept. Henceforth “systems,” with their uncontrollable boundaries, would be abandoned for a more tractable art-world discourse of “institutional critique,” one that Artforum authors and editors would be active in promoting. We might consider whether institutional critique is, indeed, our “ritual drama,” with the secret life of systems that undergirds it emerging later, and elsewhere, in unacknowledged ways. But systems’ virions survived. By the 1990s, what I would call systemic artworks had emerged with a vengeance. Just as Burnham had recognized an array of physical and material entanglements in work otherwise described as Conceptual or dematerialized, systemic artworks dialectically reject or critically torque the virtual ideologies of the Internet to materialize the links that join archival, research-driven, process-oriented, labor-intensive, recursive, informational, social, and communicational aspects of art. In 2012, Burnham’s concerns about everything from the consumption of natural resources to the implementation of machine technology seem tailor-made for the contemporary art world. Take Documenta 13 this past summer, where such systematics were witnessed in the crowd of artists offering soil currency (Claire Pentecost), time banks (Julieta Aranda and Anton Vidokle), off-limits apiaries (Pierre Huyghe), or machine-propelled air currents (Ryan Gander). And Burnham’s words to Kepes from November 1967 are entirely in line with the Arup-infused logic of much contemporary art and architecture: “What I propose is not that the artist become an engineer, but that for some phases of his problem-solving it would be advisible [sic] for him to think like an engineer [managing] input-output exchanges of materials, energy, and information.”¹⁴ If Burnham turned from the systems he prophesied, we would find it impossible to do so. We cannot turn from them because they are turning within us, the dynamic engine of our imbrication in many aspects of lived realitythe art world, but also the economic, legal, ecological, and political worlds we navigate and that seem to implode or explode daily. Whether or not we want to see or name them, systems are us. Caroline A. Jones is director of the history, theory, and criticism program at the Massachusetts Institute of Technology. 1. Jack Burnham, “Art and Technology: The Panacea That Failed,” in Myths of Information: Technology and Postindustrial Culture, ed. Kathleen Woodward (Madison, WI: Coda, 1980), 200–215. 2. Pamela Lee, Chronophobia (Cambridge, MA: MIT Press, 2004), 74. 3. For elaboration of this argument in terms of Haacke’s “weather” systems of 1967, see my Hans Haacke 1967 (Cambridge, MA: MIT List Visual Arts Center, 2011). 4. Michael Fried, “Art and Objecthood,” Artforum 5, no. 10 (Summer 1967): 23. 5. 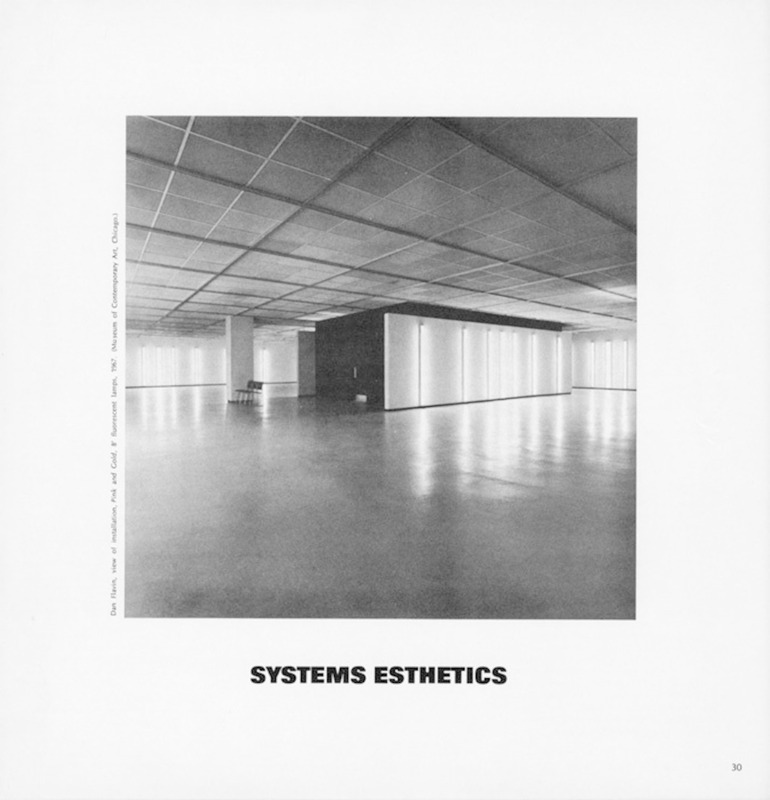 Jack Burnham, “Systems Esthetics,” Artforum 7, no. 1 (September 1968): 31. 7. Jack Burnham, Hans Haacke wind and water sculpture: supplement to Tri-Quarterly (Evanston, IL: Northwestern University Press, 1967). 8. Wiener gave permission for a reprint of “Pure Patterns in a Natural World” for Gyorgy Kepes’s 1956 collection The New Landscape in Art and Science, and Ludwig von Bertalanffy contributed “The Tree of Knowledge” to Kepes’s 1966 Sign, Image, Symbol. 9. Burnham, “Systems Esthetics,” 35. 10. Jack Burnham, “Real Time Systems,” Artforum 8, no. 1 (September 1969): 49. 11. Ibid., 51. This assertion was accompanied by a picture of Haacke’s Chickens Hatching, 1969. 12. Burnham, “Hans Haacke’s Cancelled Show at the Guggenheim,” Artforum 9, no. 10 (June 1971), reprinted in Amy Baker Sandback, Looking Critically (Ann Arbor, MI: UMI Research Press, 1984), 105–109. 13. Jack Burnham, “Introduction,” in Great Western Salt Works: Essays on the Meaning of Post-Formalist Art (New York: Braziller, 1974), 11. 14. This quote is from the course Burnham had developed with engineer Gustave Rath and proposed to teach at MIT. Annotated in Burnham’s handwriting “for G. Kepes,” the typescript is titled “Some thoughts on systems methodology applied to art.” Burnham file, Center for Advanced Visual Studies archive, MIT, Cambridge, MA, provisionally dated with the letter that refers to it, November 1967, ts p. 1.